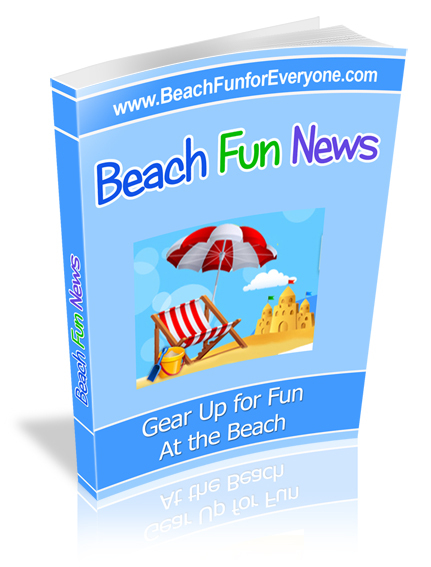 There are many floats, toys and sun protective clothing for kids at the beach. 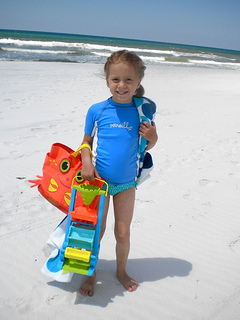 Age appropriate is the key from U.S. Coastguard approved vests to boogie boards for some fun wave time, there are lots of beach gear that will entertain and provide a safe day on the beach or in the water. 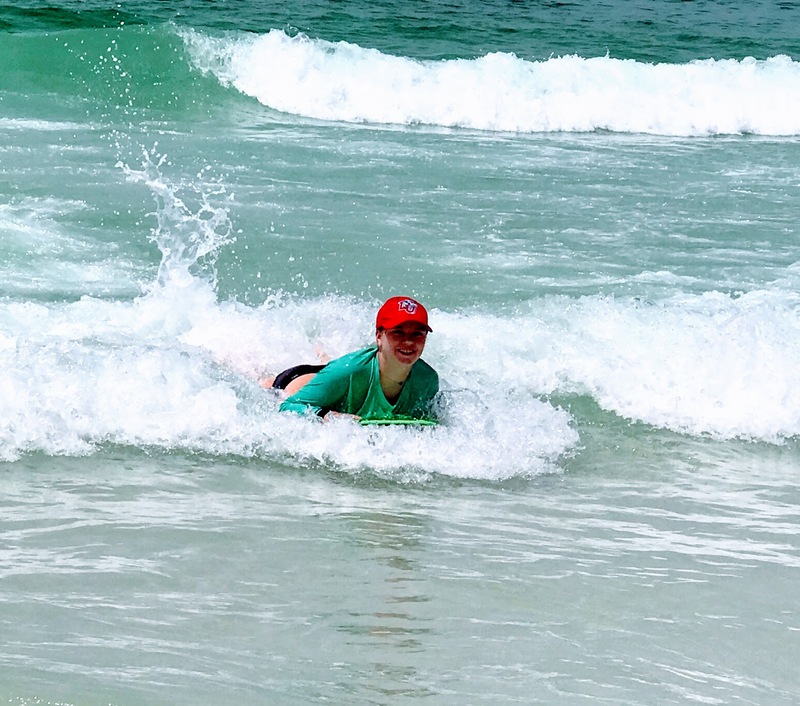 Make the most of the waves when you are at the beach with either a boogie board or a skim board or both. Body boards or boogie boards are used to ride the waves while the skim boards are thin and flat and are used in shallow water. Get out some paddles, frisbees, corn hole or ladder toss and make some memories tossing, catching, jumping and chasing. Light up frisbees for nighttime games and soft foam frisbees for beginners. Slammo will have your group fighting for their turn and a fabric corn hole is light enough to carry from your car or like we did, on our bikes. 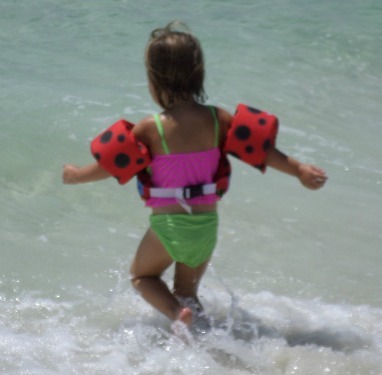 Our fearless granddaughter loved the ocean but especially swimming in the waves. While of course we were always right by her the Stearns Puddle Jumper Deluxe Life Jacket provided some extra safety. It fits over the chest with arm floats. Unlike the old life jackets that ride up the chest these allow kids to move and swim without feeling like they are wearing a life jacket. Soft polyester fabric makes them comfortable to wear with less chafing. These are good for children 30-50 lbs. (13.6 kg.-22.7 kg.) 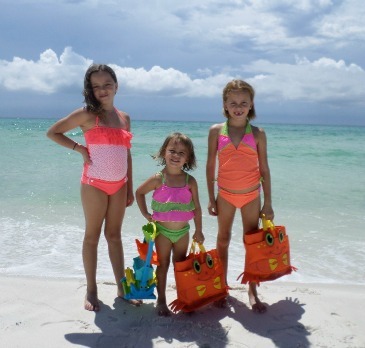 The Coast Guard-approved life jacket comes in several different styles and colors. Because it clasps in the back kids can't unclasp it, but if it is not on tight, a child can wiggle out - so anytime a child is in the water, adult supervision is required. This is a good option for kids for a day at the beach, river, lake or pool. The best sunscreen for kids is one that offers protection from the sun but is free of toxins that are absorbed into the body through the skin. The majority of sunscreens contain ingredients that have never been tested and contain carcinogens, hormone disrupters and allergens. Even as a registered nurse I didn't realize that the majority of sunscreens contain harmful ingredients. Combine that with repeated use of these lotions that are spread all over the body, it's important to find out how to make safe choices to protect your children. 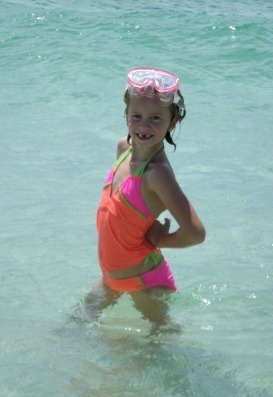 One of our favorite brand of two piece swimsuits for girls is Kanu Surf. High quality fabric and fun colors and designs make them an easy choice. Depending on what design you choose the company offers sizes ranging from 2T to 14 girls. 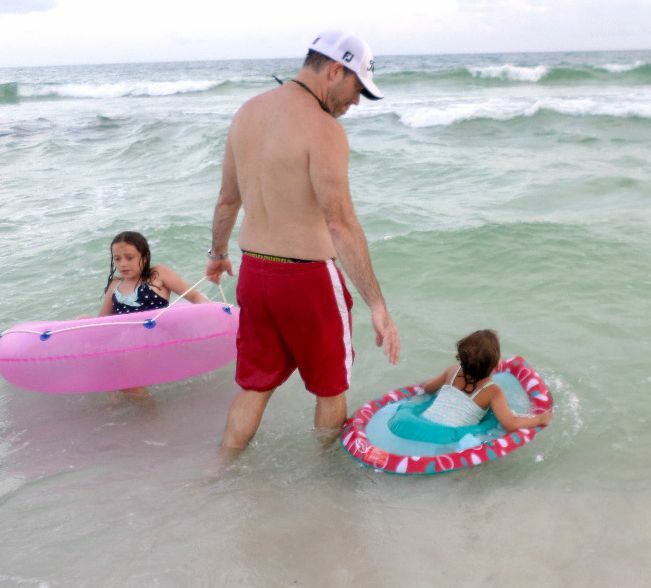 Our grandkids love to "explore" the bottom of the ocean, looking for shells, fish and crabs. Whether it's salt water, chlorine water, or lake water, protecting their eyes is easy with a pair of swim goggles. We especially like these lenses that are bigger which provides better visibility and a wider field of vision. They don't fog and they don't leak - at least for our kids. We like how the straps can be easily tightened and loosened and the ergonomic design means they feel comfortable and kids will enjoy keeping them on. The Small/Medium is for shoe size 1-3, large/extra large is for shoe size 3-6. The flipper straps adjust easily as does the mask. You never know what one might find with a good snorkel set. Our granddaughter found 15 pairs of sunglasses on one of her underwater searches. Kids may actually enjoy carrying their sand toys if they have their own beach bag, like this cute Melissa and Doug crab beach bag. Just the right size for a couple of sand toys so it's not too heavy and not very big. The mesh bottom means that sand can easily escape but just run it under some water to get the rest of the sand off. There is a large inner pocket and outer pockets as well. The bright colors are adorable and even after 3 summers of use, the colors have not faded. Melissa and Doug offer two designs - they are the same size - the orange crab and a blue octopus. 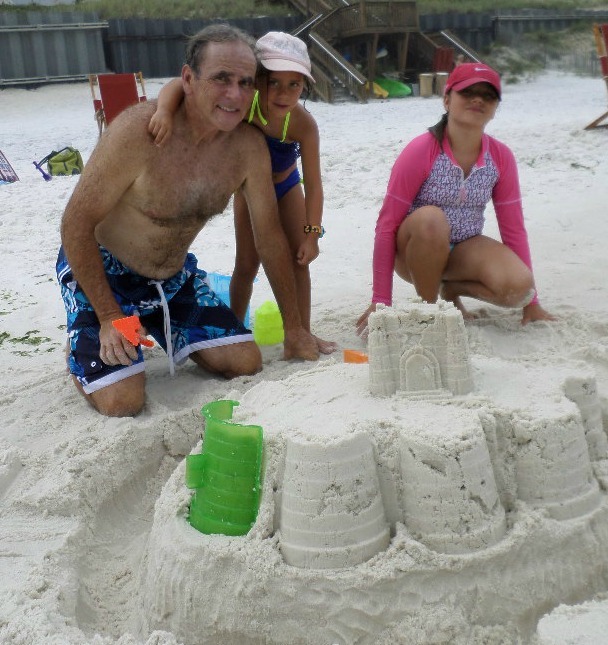 What's a beach vacation without making a sand castle or digging in the sand? 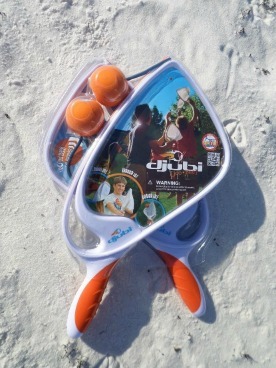 Buckets, shovels and sand forms appeal to all ages and genders and come in a variety of options. Make cupcakes, cookies or ice cream cones or haul sand with a dump truck and front loader. If you want a kids' beach chair that appeals to kids, then let them have a seat on Mr. Octopus. With their own chair and drink holder, they may actually take a break from playing in the sand and the water for a little respite. Made of durable, fade-resistant fabric, it holds up to 125 pounds. It folds down and up easily so that even a young child can set the chair up. Kids 2 to 7 would find this portable chair fun to have at the beach. Our kids have grown accustom to wearing rash guards. They have little interest in sitting underneath an umbrella nor re-applying sunscreen throughout the day. 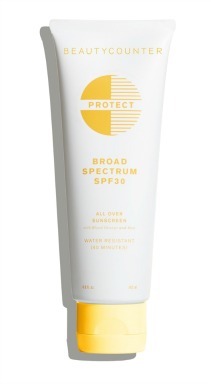 Without sun protection clothing, sunscreen needs to be re-applied every 2 hours if kids are in and out of the water and toweling the lotion off. A simple solution is to keep them protected with long sleeve rash guards that protect their back, front, and arms. You can purchase just the tops or two-piece UV protection swimsuits that include matching swim shorts. 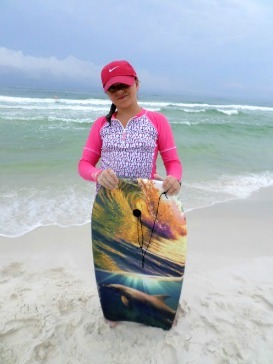 Or just match up a solid colored rashguard with your kids swim trunks or bottoms of a two piece swim suit. The swimsuit fabric is lightweight, dries quickly and is comfortable to swim in. 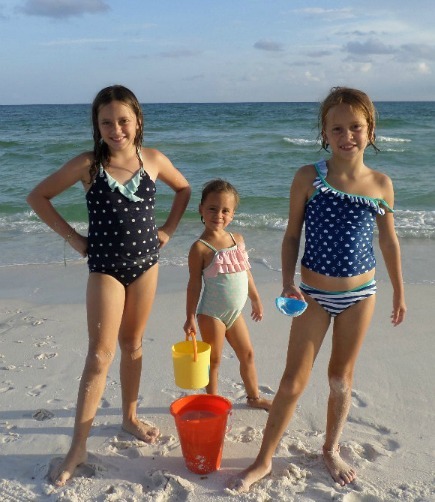 Check out why UV protection swimsuits and beach wear should be an important strategy in preventing sunburns and protecting skin from future sun damage. Polarized lenses reduce glare making these glasses comfortable to wear. You want them to fit snug but not tight so that they eyes are protected from uv light entering in on the sides or the top. These are somewhat of a wrap-around sunglasses. 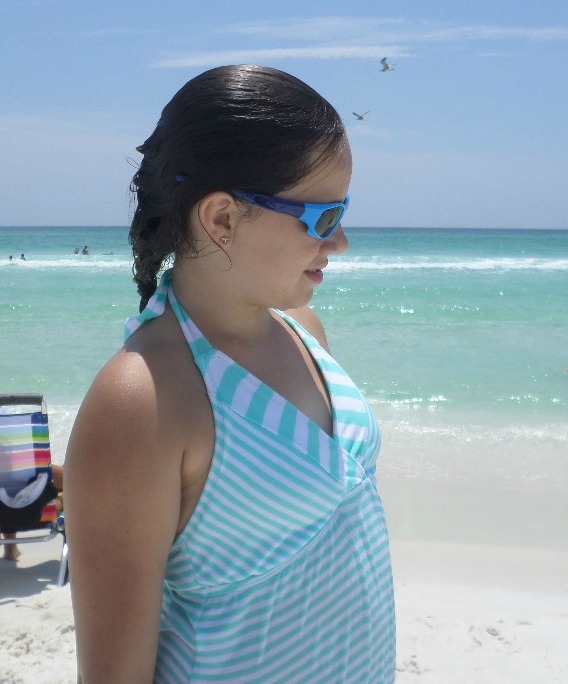 Provide cool sunglasses for your kids for all day sun exposure. Did you know that wearing sunglasses at sunrise and sunset is just as important as during the day? We found them to fit our 9 and 11 year old granddaughters but not our 5 year old. Our grandkids love getting their own special beach towel that's geared toward their interests - horses for one, Minnie Mouse for another and dolphins for the other one. You always know which towel belongs to who so there is no fighting or shall I say confusion when it comes time to drying off. Look for 100% cotton as this type of fabric is more absorbent even though it is a thinner towel. For smaller kids hooded towels come in a variety of characters, like mermaids or sharks. They provide extra warmth for any shivering bodies getting out of the water. 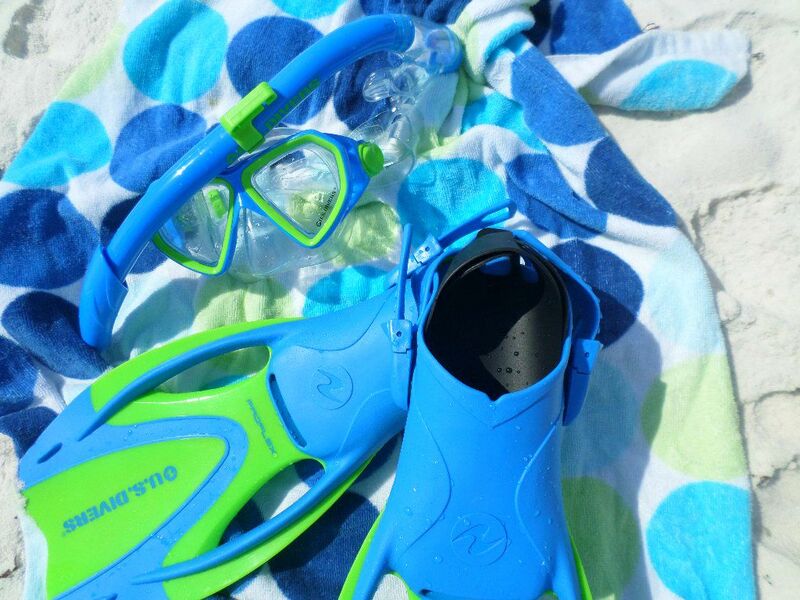 Keep your kids safe in the water, protected from the sun, while having a fun day of making memories at the beach.